"The greatest of all time died on March 9..." ehh... I don't think so. Here is my list of the top ten rappers who are dead. I based my ranking on how fresh they were when they were alive, their contributions to hip-hop. And if they were alive, would their music be any good? I excluded cats like Jay Dee, Jam Master Jay, Freaky Tah, and Scott La Rock becuase they weren't really emcees. Jay Dee was more of a producer and Freaky Tah more of a hype man. Anyway, here's the list. Death: On Saturday, September 8 1989, Cowboy died of complications from HIV AIDS. He was two weeks shy of his 39th birthday. When people think of Grandmaster Flash and Furious 5, they first automatically think of Melle Mel, but Cowboy was the backbone of the group along with Scorpio. There wasn’t much publicity when he passed, mostly because he already contributed what he had to the culture. Death: MC Trouble died of an epileptic seizure in 1991, on her 19th birthday. MC Trouble was the first female emcee ever signed to Motown Records. In 1990 she made her rounds on BET and YO! MTV Raps with “(I Wanna) Wanna Make You Mine”. The track was hot, and unfortunately she died before really making a name for herself. Death: on December 10, 1995, Darren "Buffy, the Human Beatbox" Robinson died of a heart attack in Rosedale, New York. He was 28 years old and reportedly 450 lbs. Growing up I was a huge fan of the Fat Boys. They were funny, confident and made some fresh music. I think after their movie Disorderlies they pretty much worn out their welcome. They broke up for awhile, which was fine. Prince Markie Dee was doing his thing. Then talk of reunion surfaced, which I think would have been dope over some those beats from the mid-90’s from Pete Rock, Large Professor, or Evil Dee. I mean it worked for Run-DMC and “Down with The King” right? Death: In 1995, Eazy-E entered the hospital with what he believed to be bronchitis. He was diagnosed with AIDS, and almost immediately announced his illness to the public. He died soon after, on March 26, 1995. Eazy E didn’t write his own lyrics until the last years of his life. He was wack. But when Cube or Ren wrote them, he was one of the best emcees ever. He had the perfect voice, look and attitude. If it wasn’t for him, there’s a lot of things that wouldn’t have happened in hip-hop. Death: In April 1999: "Grym Reaper" was diagnosed with a deadly colon cancer, and was given only three months to live. On Sunday, July 15, 2001, Anthony “Grym Reaper” Berkeley passed away, almost two years longer than the time he was given by the doctors. Most people forget about Grym, but his contributions to the first two excellent Gravediggaz albums and the heart and passion he showed on the last Gravediggaz album has to be applauded. He was an excellent emcee, but honestly I don’t miss him as much as some other emcees. Death: ODB collapsed at approximately 5:29pm on November 13, 2004 at Wu-Tang's recording studio. He was pronounced dead less than an hour later, only two days shy of his 36th birthday. He had a lethal mixture of cocaine and the prescription painkiller Tramadol in his system at the time of his death. I liked ODB. I liked his personality; I liked his unpredictable nature and just his craziness. It made for funny, entertaining hip-hop. His flow wasn’t to bad either, especially on the DJ Premier-produced cut “Pop Shots” with M.O.P. Death: Tupac was shot in a drive-by on September 7, 1996 after the boxing match between Mike Tyson and Bruce Seldon in Las Vegas. Shakur was hit several times (including once in the lung) while attempting to jump in the back seat. He died in the hospital on September 13, 1996. I really haven’t had an urge to want to hear new Tupac music at all. He made so many tracks that they’re still coming out almost a decade after his death. I would like to see what he would be doing nowadays and if he ever would have squashed his beef with everyone. Although lyrically, Pac has never impressed me, but his passion, charisma and honesty always caught my attention. Me Against the World is still his best album. 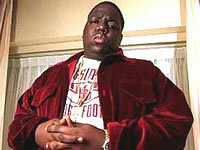 Death: On March 9, 1997, Biggie was shot and killed in Los Angeles, where he had been attending a party by VIBE Magazine near the Peterson Automotive Museum. After hearing the Duets album, and the regurgitation of Biggie lyrics that we’ve heard over and over again, it would definitely be nice to hear him spit some new stuff over beats from the Neptunes, Kanye and Timbaland. He’s really one of the best that’s ever done it. I’m a Big Pun fan, and it really hurt my heart when he passed. It was cool to see a Latino represent with skills plus make dope hits. I really put him up there with Biggie, Jigga, Rakim, Nas, you know, the legends in the game. He just left too early to do more than he did. Death: On February 15 , 1999 Big L was shot seven times in the head and chest and killed on 139th Street, just blocks away from his Harlem home. He was 24 years old. I think Big L is the illest emcee who is no longer alive. Listening to his first album and then his posthumous album, you’ll hear some of the illest metaphors and similes ever spoken. He was on his way to signing with Roc-A-Fella Records. How nice it would have been. Would Big L have made your list of top 10 dead rappers at all? Who'll be the illiest and funkiest cat on your list? Let's know what you make of Q's views.